Pakistani-American scholar Dr. Moeed Yusuf has examined the role of the United States in defusing South Asian crises since the nuclear tests conducted by India and Pakistan in 1998. 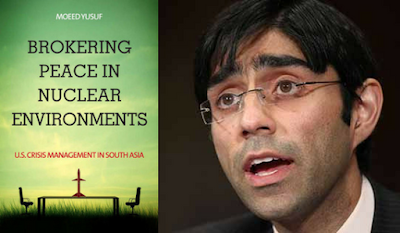 In "Brokering Peace in Nuclear Environments U.S. Crisis Management in South Asia" by Dr. Moeed Yusuf published by Stanford University Press, the author analyzes American diplomacy in three critical periods: Kargil conflict in 1999; the stand-off after the Indian Parliament attack in 2001 and the terrorist attack in Mumbai in 2008. Yusuf argues that the US-Soviet Cold War deterrence model does not apply to the India-Pakistan conflict and offers his theory of "brokered bargaining". In chapters that detail the US role during three India-Pakistan crises, it is clear that the US rejected India's insistence on bilateralism in resolving India-Pakistan disputes. The author says that "in each episode, the concern about the escalation forced the United States to engage, largely unsolicited, and use a mix of rewards (or promises of) and punishments (or threats of) with the regional rivals to achieve de-escalation--ahead of its broader regional or policy interests." It seems that Yusuf accepts the widely-held assumption that India enjoys insurmountable conventional military superiority over Pakistan. Many speculate that the difference between the conventional military strengths of the two South Asian rivals is so great that Pakistan would be forced to quickly resort to the use of nuclear weapons in the event of an Indian attack. Such assumptions and speculations are challenged by Professor Walter Ladwig of the War Studies Department at London's Kings College, Meenakshi Sood of Delhi-based Indian Army think tank called The Center for Land Warfare Studies, and other scholars. Professor Walter Ladwig believes that Pakistan’s conventional deterrence against India in the near to medium term is "much better than the pessimists allege". Pakistan's NCWF (New Concept of War Fighting) developed in response to India's CSD (Cold Start Doctrine) is designed to "mount a counter-offensive even before India fires the first shot", according to Indian analyst Meenakshi Sood. Ladwig sums it up well: "Despite a growing technological edge (over Pakistan) in some areas, Indian policymakers cannot be confident that even a limited resort to military force would achieve a rapid result, which is an essential pre-condition for deterrence failure". One could argue that Yusuf gives too much credit to the US efforts in de-escalating India-Pakistan crises. It creates the impression that brown leaders are less rational than their white counterparts in dealing with existential crises. It perpetuates the stereotype that only a select few nations in the West can be trusted with weapons of mass destruction. It justifies the nuclear Apartheid being pursued by the United States in the form of nuclear non-proliferation treaty (NPT). Could it be that the author's research is heavily influenced by the fact that he works for the United States Institute of Peace which is a US government-funded Washington think tank? Overall, Dr. Moeed Yusuf's "Brokering Peace in Nuclear Environments U.S. Crisis Management in South Asia" is a thought provoking book. It should stimulate serious discussion of how regional nuclear powers like India and Pakistan can engage with each other more deeply to maintain peace and stability in their neighborhood. This will require both parties, India and Pakistan, to have sustained dialog to resolve core issues like Kashmir that underly recurring crises. Funding of Hate Groups, NGOs, Think Tanks: Is Money Free Speech? Living in the US, stooges of his ilk have to prove they're more loyal than the king to justify their existence and to earn bread and butter for their living. He and his types are always trying to seek opportunities to create an element of fear forcing Pakistan to accept the hegemony of India and her new bed fellows. Not anymore my dear Moeed Yousaf. Those days are over. moeed yousuf is a seasoned political scientist . yousuf is pakistani he knows everything from inside . We got to accept that US has brokered peace and prevented escalation. That's why both India and Pakistan aren't in ashes. Moeed Yusuf writes regularly for Dawn, and after reading two or three of his columns, I ended up tuning him out completely. I don't mind reading articles that are critical of Pakistan - Pervez Hoodbhoy and Syed Talat Hussain are two writers who can be scathing of the country, and yet still informative and insightful - but Yusuf clearly is struggling with some sort of inferiority complex, and is often quite odiously sycophantic towards his host country. Sadly, this submissive myopia is notably detrimental to the integrity of his analysis. But hey, he's still being published, so clearly somebody likes him! Hasan: " Yusuf clearly is struggling with some sort of inferiority complex, and is often quite odiously sycophantic towards his host country. Sadly, this submissive myopia is notably detrimental to the integrity of his analysis." Moeed Yusuf's employer USIP is seeking nearly $38 million in funding from US Congress for FY 2019. "The United States Institute of Peace requests $37,844,000 for Fiscal Year 2019, equal to its most recently enacted appropriation in Fiscal Year 2017. The Institute requests these funds to sustain its congressional mandate to prevent and resolve violent conflict abroad, a capacity vital to our nation’s security. USIP’s work saves lives and money by reducing or averting crises that, once they have metastasized, are orders of magnitude more expensive to manage through military or humanitarian operations." Dr Yusuf also said that this model was not an effective way to resolve conflict; it merely helped to deescalate temporarily instead of solving the issue. As a result, future crises become harder to deter and may even become unmanageable. Former Defence Secretary retired Lt Gen Tariq Waseem Ghazi disagreed with this model. According to him, there is a general disregard from India’s side to engage with Pakistan on a bilateral level as well as in the presence of a third party, whether it be the UN, the US or China. Former Pakistan Nuclear Regu­l­atory Authority chairman Jams­hed Hashmi was of the opinion that the US tend to do more harm than good when trying to deescalate crises between Pakistan and India. India benefits from the current standoff. it ensures Pakistan can not deploy it's scarce capital or top quality human resources to industrialize to the extent it has and emerge as a genuine permanent threat on its border meanwhile it already is world #5 in industrial output and growing towards becoming world #3 behind only China and US in the 2020s..it's a good strategy. Exactly but what the F is Pakistan going to do about it. Solutions please. Also prepare for worse case long term scenario.suppose India becomes world #3 in 2025 and decides to scrap the Indus treaty..then what should be the response? Would it not make sense to create an alternate leverage point by allowing India access to central asia via Pakistani territory? So that in 2025 if a super right wing modi on steroids govt takes over and India has overwhelming military (1000 modern plane Air Force 6000 tanks 10 nuc sub etc) and diplomatic(It is the second largest purchaser of oil from the middle east likely to replace China as the largest as China taps Russian oil o we land in Siberia no Muslim country will sanction it just like no one does anything meaningful about Kashmir) there is atleast this potential loss of trade route card to be played.. Need for dispassionate scenario based long term foreign policy planning of the sort India does is required..unfortunately nothing is forthcoming..
Anon: " India benefits from the current standoff. it ensures Pakistan can not deploy it's scarce capital or top quality human resources to industrialize..."
India threw away its substantial conventional military edge over Pakistan when the Hindu Nationalist government of Atal Bihari Vajapayee decided to carry out its nuclear tests in 1998. It gave Pakistan the justification it needed to go nuclear a few weeks later, thereby achieving balance of terror with its much larger neighbor with a huge conventional military. Indian analyst Krishna Kant explains his country's policymakers blunder as follows: "Nuclear weapons have reduced Pakistan defense cost while we (India) have been forced to spend tens of billions of dollars to acquire latest military hardware in a bid to retain the edge. Its shows in the defence budget of the two countries since 1999 nuclear blasts. All through 1980s and 90s, Pakistan was spending around a third of its government budget and 5-6% of its GDP on defence, or about twice the corresponding ratios for India. After going nuclear, Pakistan’s defence spending decelerated and its share in GDP is expected to be decline to around 2.5% in the current fiscal year, slightly ahead of India’s 2%. This is releasing resources for Pakistan to invest in productive sectors such as infrastructure and social services, something they couldn’t do when they were competing with India to maintain parity in conventional weapons." Anon: "Also prepare for worse case long term scenario.suppose India becomes world #3 in 2025 and decides to scrap the Indus treaty..then what should be the response?" Number 3 has never counted for much in international geopolitics. If ever becomes number 3, it would change little for nuclear armed Pakistan capable of annihilating India if India ever poses a serious existential threat to Pakistan. As to the water cutoff, it's just an empty threat by crazy Hindu Nationalists. Can India really threaten Pakistan over water? TFT asked Jaweid Ishaque, an economist who has worked in agriculture and is editing a forthcoming monograph on water in Pakistan by Adnan Asdar Ali, a civil engineer with diverse experience in structural and forensic engineering, who has become an advocate for awareness on water in Pakistan. TFT: Why have they left it like that? JI: India has built a lot of dams—small dams. You need to undertand the geography to understand the politics. They will have to let the water through particularly from May to September which is peak monsoon flow season. It is all dhamki that they will stop our water. Let’s assume India decides to store and build storage for 10MAF on the eastern rivers, which it could do. But the day India takes over 5% Pakistan can go to the IWC Tribunal or even the ICJ. Both these courses are open to us, without need for recourse to diplomatic spats or armed threats. TFT: So India just sat there all these years? JI: The IWT of 1960 has a clause that says that for 30 years, other than these approved projects, India and Pakistan can’t interfere in each other’s waters and cannot make any structures on rivers allocated to the other country. Even beyond the 30 years if India wishes to develop dams or barrages on the western rivers they will need to share the design so Pakistani experts can ensure that the parameters of minimum water storage are being complied with. We are making them on the western rivers, but they are already approved. We did Mangla, then Tarbela and then we had approval for two or three more. We have exclusive use by the treaty. We can keep on making dams on these western rivers whether for hydel or storage. India started planning in 1987 because the 30 years were to be over in 1990. They prepared for Wullar barrage in 1987 and for Baglihar around 1996-97. It was completed in 2011-12. Kishanganga started in 2007-2008 and is still being planned and it is a problem as it is on the Neelum. They state it is their river, which we dispute since it is a tributary of the Jhelum, meeting at Muzaffarabad and will directly impact the inflows into our river rights. These design features are still under adjudication by the Arbitrator under IWT provisions, which Pakistani experts are pursuing vigorously. Whatever they did was after 1990. The clauses said you can do hydro, you can do run-of-the river and you can do storage, but not more than what the clauses specify, which is why we objected to the design of Baglihar and Wullar. In Wullar barrage our position was held up. In Baglihar our contention was modified. India had actually offered in 2008-09 that they were willing to modify the design just enough to to maintain what is called the mean dead level. You are allowed to keep a mean dead level of water otherwise the damn starts to silt up. But the PPP government at the time insisted on going to the international court. At the end of the day, even if there is a difference of say 1MAF, is it worth bad relations? decade ago, the world watched in disbelief as terrorists from the Pakistan-based Lashkar-e-Taiba group ripped through the Indian financial capital of Mumbai. By the time the 10 attackers were stopped four days after the assault began, they had killed 164 people—Americans and other foreign nationals among them—and left over 300 injured. India’s 9/11, as the Indian media dubbed it, had unfolded. India, having long seen the Lashkar-e-Taiba as a direct proxy of the Pakistani intelligence outfit, the Inter-Services Intelligence, blamed the Pakistani state for having directed the attack. A near-war crisis between the two nuclear neighbors ensued in its wake, offering a stark reminder why U.S. President Bill Clinton termed this part of the world “the most dangerous place” on Earth at the turn of the century. Ten years after the Mumbai attacks on November 26, 2008, the Indian-Pakistani rivalry remains as entrenched as ever. While the two countries have avoided major wars, they continue to flirt with crises and have been engaged in low-intensity conflict in the disputed territory of Kashmir. This has unfolded in an environment devoid of any robust crisis management mechanisms aimed at reducing the risk of inadvertent escalation and providing dependable ways of directly negotiating a way out of a crisis. With nuclear weapons in the mix, the consequences of escalation could be catastrophic—and the possibility of such an outcome is greater today than it was on the eve of the Mumbai attacks. India and Pakistan came “fleetingly close” to war during the Mumbai crisis, but fortunate circumstances prevented a military clash. The attacks came on the back of the single most promising peace process the two have ever had. The overall aura of positivity and the trusted channels of communication created through their five-year peace bid helped relieve tensions. A dovish Indian prime minister, Manmohan Singh—who was genuinely interested in peace with Pakistan and hesitant to use military force to settle disputes, especially in South Asia’s nuclearized environment—also led India to forego the military option, even as the Indian public and media were calling for blood. Most importantly, third-party states, led by the United States, played crucial mediatory roles and were instrumental in nudging India and Pakistan to end the crisis. Pakistan has been increasingly vocal and aggressive in alleging Indian support of terrorist incidents in Pakistan. Terrorism isn’t the only worry. The “Line of Control” that divides Indian and Pakistani control of Kashmir is also a likely flashpoint. Violence levels along the Line of Control were the highest in 15 years in 2017, with violations of a cease-fire agreed to in 2003 consisting of prolonged and often significant military hostilities.